What Happens When the Disability Insurance Trust Fund Runs Out of Money? Last week, the non-partisan Congressional Budget Office (CBO) put out an update of the financial status of the Social Security system’s finances (using, by the way, new “infographics” to illustrate the issues). To policy wonks like myself who follow Social Security’s more closely than we do the Major League Baseball standings, the report simply confirms what we already know – namely, that the Social Security system is on a financially unsustainable course and that it is doomed to insolvency unless Congress gets its act together and makes some difficult decisions. What really hit the news cycles in the past week, however, was the fact that the expected date of insolvency of the Disability trust fund is now just five years and a few months away – the year 2017. This is a couple of decades earlier than we usually talk about exhausting the Social Security trust funds, and thus, I suspect, this news has caused some confusion. So this blog attempts to explain how the trust funds work, and what the exhaustion of the trust fund means for recipients of disability payments. First, it is worth knowing that the Social Security program is really more than one program. Formally, there is the OASI program (Old-Age and Surivivors’ Insurance – think of this as the program for retirees and their widowed spouses), and the DI program (Disability Insurance – this is the one that pays benefits to workers who have a disability that severely limits their ability to work). Second, while we often talk about the “Social Security trust fund,” there are, in fact, two separate funds – one for OASI, and one for DI. While these are legally separate funds, they are often talked about as a “combined trust fund,” and most of the debate about the long-term problems facing Social Security use data on the combined trust fund. This masks, however, the fact that the current financing status of the OASI and DI programs are not exact duplicates. Specifically, the DI trust fund is expected to be exhausted much sooner than the OASI trust fund – 2017 according to the CBO’s most recent estimate. Third, while we economists can forever debate the economic meaning of the trust funds (I will spare you this debate for now), there is little question about the legal meaning of the trust funds. Specifically, it is widely understood that so long as the DI trust fund has a positive balance, the Social Security Administration can continue to send out benefit checks to DI recipients, even if the tax revenue flowing into Social Security from the DI portion of the payroll tax (known as the FICA tax) is insufficient to cover benefit payments. This is because the DI trust fund can redeem the U.S. government bonds that it is holding. And as long as the U.S. Treasury does not default on its obligations, this means that the Social Security Administration has the legal authority to issue checks. So, what happens if and when the DI Trust Fund runs dry in 2017? Well, if Congress failed to act in any way (an outcome I consider implausible, and will say more about below), the Social Security would find itself in a position in which it did not have sufficient dedicated revenue to cover benefits. The most likely scenario is that they would begin delaying the issuance of checks to beneficiaries. Eventually, the backlog of checks would grow so long that it would amount to a benefit cut – beneficiaries may only get 11 checks per year instead of 12, for example. This would be a terrible outcome, because no matter what your views on the role or size of government, it is hard to explain how reneging on payments to some of our most financially vulnerable citizens is the best way to close a budget shortfall. You may wonder why the Social Security Administration could not just “borrow” some of the OASI money to pay the DI beneficiaries. And the short answer is that the agency does not appear to have the authority to do this. Rather, it would require an act of Congress to re-allocate the proportion of the payroll tax revenue that goes to each program. As they did in the 1980s, for example, Congress could simply state that a larger fraction of the existing FICA tax go to DI instead of OASI. This patches the short-term problem facing DI, and allows checks to go out. Of course, it is also “robbing Peter to pay Paul” because it simply makes the OASI trust fund go dry that much sooner. What we really need is thoughtful reform of both the OASI and DI programs. Both are important programs to the well-being of individuals who are retired or disabled, but both programs are also not financially sustainable. We need to adjust benefits, taxes or eligibility in order to bring the system back into long-term balance. So the good news is that those who rely on the Social Security Disability Insurance program most likely have little to fear about the 2017 insolvency date, because Congress will most likely paper over that problem by reallocating the FICA tax. But the bad news is that their ability to do so will most likely lead to further delays in making the serious reforms that these programs so badly need. This just in: Both Sides of Health Reform Debate Twist Facts to Support Own View. Public Shocked! Of course, we all knew this. But, the Washington Post had a couple of interesting op-ed pieces last week that really drove home the point. The fun part was that the two pieces, written by Charles Krauthammer and Eugene Robinson, appeared next to each other on my computer screen and exposed the disingenuousness of both the Democratic and Republican positions on the financial aspects of the Patient Protection and Affordable Care Act, aka “ObamaCare,” or, more neutrally, PPACA. Let’s begin with Robinson, who takes aim at the Republican’s self-serving and somewhat hypocritical approach to the numbers in promoting their repeal of PPACA through the ominously-named “Repealing the Job-Killing Health Care Law Act.” Now, the Republicans painted themselves into a bit of a corner on this one from the get-go. Swept into the House majority on a promise to decrease the deficit, they were faced with the fact that PPACA, at least on paper, lowers the deficit over the next 10 years. The fist bit of Republican tap dancing around this point came earlier this month when the new majority enacted new rules in the House specifying that every new law had to explain how any new spending it proposed would be offset by an equivalent cost reduction. Deficits, after all, are bad. This “cut-as-you-go” rule, however, specifically exempted PPACA repeal from this requirement. So, I guess deficits aren’t all that bad after all. So, Republicans are not above picking and choosing which numbers to ignore and which to exaggerate to make their point. On to the Democrats. Krauthammer takes on the Democrats’ cooking the numbers in the original PPACA bill in order to make it look like it reduced the deficit when it will actually add to the deficit (i.e., new expenditures will be greater than new revenues in the long run). Now, cooking the CBO’s score is a time-honored practice in Washington. The key is this. The CBO is the most gullible body in the government. By law, they are required to take whatever Congress puts into a bill and score it as if it is actually going to happen. So, if Congress tells them that they are going to spend $50 billion on a bridge to Hawaii and pay for it by taking all of Bill Gates’ money, CBO will come back and say “awesome. That will reduce the deficit by $4 billion.” As I said, this is nothing new. Remember how the Bush Tax Cuts were scheduled to expire at the end of last year? Same deal. So, to cook the books on PPACA, the Democrats did the following. The new taxes and revenue sources for health care were scheduled to start coming online almost immediately, while the new expenditures were scheduled to start much later. So, according to Mr. Krauthammer, “the entitlement [PPACA] creates – government-subsidized health insurance for 32 million Americans – doesn’t kick in until 2014. That was deliberately designed so any projection for this decade would cover only six years of expenditures – while that same 10-year projection would capture 10 years of revenue. With 10 years of money inflow vs. six years of outflow, the result is a positive – i.e., deficit-reducing – number. Surprise.” And, Krauthammer argues, PPACA does the same with its new long-term care insurance program, where it starts collecting premiums immediately but doesn’t pay anything out for 10 years, resulting in a surplus, at least on paper, according to the rules. Krauthammer also makes the additional point that although PPACA is supposed to decrease the budget by $230 billion (the numbers differ between the two articles), the way it does it is through offsetting $540 billion in new spending by $770 billion in new taxes. This “radical increase in spending, topped by an even more radical increase in taxes” is probably not what most people had in mind when they heard that the bill reduced the deficit by $230 billion, and certainly much different than simply cutting $230 billion in government spending. But, that’s perhaps a topic for a different day. So, both sides are twisting the numbers and sloganeering. Am I shocked like Claude Rains in Casablanca? Well, I guess I am, which is to say, not shocked at all. Am I frustrated? Definitely, because there are real problems in health care that have to be addressed. Even if you are a fan of PPACA, you have to admit that it was at most a first step toward reforming health care in this country. Real progress is going to require cooperation on coming up with solutions. As long as both sides are deliberately twisting the facts to score political points, we aren’t going to make progress. Despite the Republican’s grandstanding on the issue of repealing PPACA, it’s not going to happen. There is a glimmer of hope. Along with the political theater, Republican leaders in the House are instructing committees to get to work on legislation to replace PPACA. Without Democratic support, such legislation will never become law. But, maybe, just maybe, if the two work together, they can come up with something that actually improves on PPACA and begins to work on the excessive growth rate of health care costs in this country, which is what I and many others have said is the real ticking fiscal time bomb facing this country. Hollywood is abuzz today with the news of the 2010 Academy Award nominations. If there were a category for “Most Frightening,” surely the newly released 2011 federal budget would be the odds-on favorite. Released yesterday, the budget contains some difficult-to-swallow news about the difficult choices ahead of us. Let me just highlight some of the more frightening numbers – all of which can be found in the proposed budget. Even with the President’s proposed tax increases and spending cuts, the projected single-year deficit never falls below $706 billion (that, in year 2014). Indeed, it starts with a projected FY 2011 deficit of $1.566 trillion, and ends in 2020 with a $1 trillion deficit. The debt held by the public is projected to roughly double over the next decade, from $9.3 trillion in 2010 to $18.57 trillion by 2020. Of course, the economy is growing over this time (at least we all hope), so more meaningful numbers are relative to GDP. The debt held by the public will rise from 63.6% of GDP to 77.2% of GDP over the next decade. I’ve written previously about why deficits matter, primarily because they serve as a drag on long-term economic growth. President Obama’s very talented budget director Peter Orszag understands this as well as anyone. But as bad as things look over the next few years, we need to recognize that the really long-term budget forecasts are far worse. It is no secret that the biggest drivers of increased government spending over the long-run are the “Big Three” (meaning entitlements, not the auto-makers). Growth in spending on Medicare, Medicaid and Social Security are projected to outpace overall economic growth for as far as the eye can see. Unless these programs undergo structural change to rein in costs, the implications for our economy are enormous. Consider this: for most of the last 50 years, government spending has stood around 20% of GDP (yes, it is higher now, but I am taking a longer-term view). According to the Congressional Budget Office, by the year 2035 (about the time today’s newborn children are starting their own households, when today’s college graduates are in their middle ages, and when today’s middle-agers are set to retire), spending on Medicare, Medicaid and Social Security will be 16% of GDP all by themselves. By 2080 (when today’s newborns are retiring), these programs will comprise nearly a quarter of GDP – a higher fraction than ALL government spending today. So unless we change these programs, the rest of the government would need to cease operation, tax rates will have to skyrocket, or we are going to watch our debt grow to unprecedented levels relative to GDP. The main drivers of these trends are rising per capita health care costs and population aging. We have so far been woefully unsuccessful at dealing with the first, and we may not want to do anything about the second (after all, most of us like living longer). In short, as bad as the short-term budget outlook is, the longer-term budget outlook is even worse. 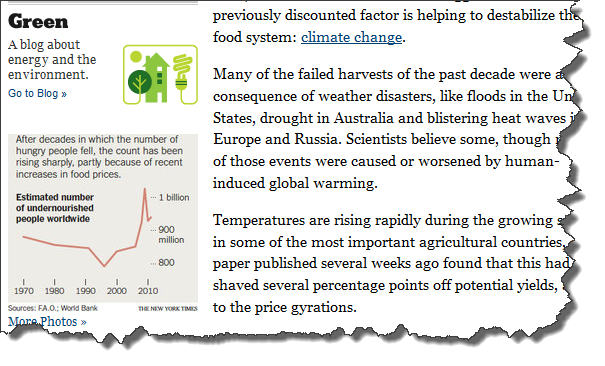 Sorry to be so pessimistic … but sometimes the facts speak for themselves.